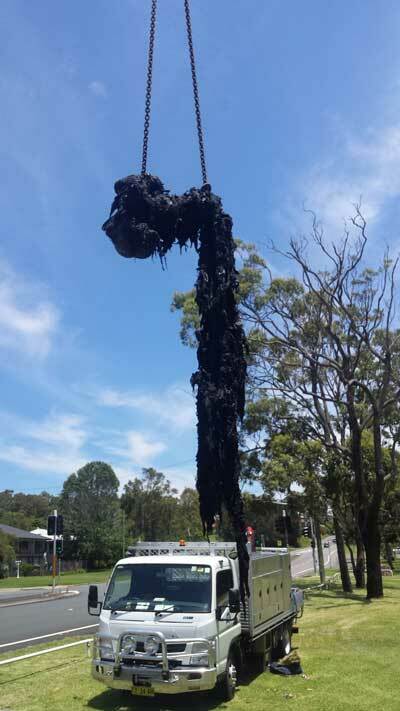 A massive blockage made up of wet wipes and sewage pulled from an underground pipe near Newcastle in New South Wales, Australia, has highlighted the problem of the increasing use of wet wipes. The Hunter Water Corporation tweeted a photo of the blockage, which was removed using a crane and buckets in the Lake Macquarie suburb of Eleebana. Hunter Water's Nick Kaiser said the wipes were becoming increasingly popular with adults around the world. "The wet wipes are being advertised as basically an extra way to freshen yourself up after the bathroom," he said. "The whole flushable wet wipe issue is actually a global issue." Hunter Water said its Eleebana sewage pumping station had been damaged as a result of the blockage. The corporation said the blockage had weighed about a tonne and took four hours to remove. Crews used a crane to remove a 7-metre 'snake' weighing about 750 kilograms. Another 300 kilograms were removed by crew members using buckets. Hunter Water said the blockage had been taken a depot for cleaning, and then sent to a local tip. Mr Kaiser said despite the marketing, wipes were anything but "flushable". "The safest way to think about what you can put down your toilet is the three Ps - pee, paper and poo," he said. "Everything else should stay out of the sewer." After living for years in Asia, I use a bottle of water to clean myself. Cutting down massive forests just to make toilet paper is this weird, temporary nordic weirdness, that future generations will shutter to think about.